Our new model showcases all of our industry- leading features like our horizontal double- walled tubular construction. Our engineers and manufacturing team have designed our patent- pending slam latch for the pens which is an industry 1st! One thing that is unique with our trailer vs. many of the competitors is that it is built from our Endura frame. This features a full width 7’ interior measurement. Most other manufacturers build their pen trailer from a lighter framed 6’ or 6’8” frame work. What does this mean for your customer? You can take the pens out of our 7’ wide, 6’ tall trailer and haul cattle! Most other brands are designed for small animal transportation only! The other brands cannot handle that type of weight or have the full width dimensions to haul them easily and safely. The Hillsboro Straight Hitch Pen Trailer is being introduced in the 18’ length. This includes a 2’ tack room plus the v-nose. 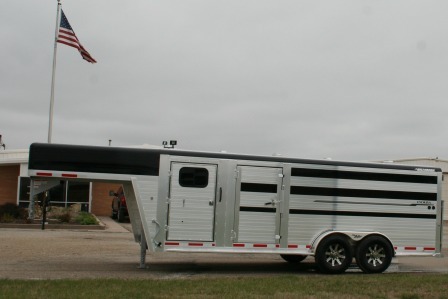 The Hillsboro Gooseneck Pen Trailer is being introduced in the 20’ length. This includes a 4’ straight wall tack room.